Campbell River Search and Rescue Society is a group of dedicated volunteers who provide a vital lifeline to those who are lost or injured in the beautiful wilderness of northern Vancouver Island. The nature of search and rescue work in British Columbia seems to be changing. Because of technology, we are doing less actual searching and more responding to calls of help from people who can tell us where they are. But the challenge for us is that we must still stay trained and ready for the next big search. Campbell River Search and Rescue would not be a fraction of what it is today, without ongoing support from our community. Local government, service clubs, businesses and individuals have contributed enormous resources toward training, equipment and facilities, and for that we are very grateful. Tax deductible donations can be made directly through our website. AdventureSmart #CRSAR has a dedicated team of AdventureSmart presenters. These volunteers are available to give prevention talks in and around our community. If you or your group are interested in a presentation, let us know! British Columbia Search and Rescue Association We can't say enough good things about our members! Like all SAR members in BC we are all volunteers. Last year our members contributed over 13,000 hours to tasks, training, public education, and fundraising. Hiker rescued after stomping SOS into snow in front of B.C.-made wildlife camera - Campbell... Signals are important and lifesaving communication when in trouble in the backcountry. Fortunately this hikers message was picked up by wildlife cameras and his story ended well! Did you know leaving a trip plan with someone before you go out into the wilderness greatly assists searchers if you need assistance? What information do think you should provide? Can you find which of these things does not belong on the list of 10 essential things to pack when adventuring? AdventureSmart Plan ahead for every adventure no matter how small it may seem! AdventureSmart will help all Canadian families, students, outdoor enthusiasts, and tourists to better understand the risks and hazards while participating in outdoor activities. British Columbia Search and Rescue Association On March 23, 2019 the Province of BC announced the largest funding grant to the 80 recognized GSAR groups in BC. British Columbia Search and Rescue Association Today marks an historic funding announcement for SAR prevention, our Critical Incident Stress Management program and the 80 recognized ground search and rescue groups. A sincere thank you to the Province in making this funding announcement happen. Provincial search and rescue funding announcement. Campbell River Volunteer Search and Rescue Society shared a live video. British Columbia Search and Rescue Association 15 years ago we started a program with hopes & plans to educate outdoor enthusiasts about personal preparedness and SAR prevention. Photos from Campbell River Volunteer Search and Rescue Society's post Our new members got their first taste of searching yesterday with our radio familiarization exercise. They managed to find all 25 clues we found in the woods! Thrilled to kick off our GSAR course for 2019 with a packed house. In addition to our GSAR students, we had a contingent from the Strathcona Emergency Program emergency communications team. British Columbia Search and Rescue Volunteer Memorial Today volunteers from PEP Air, Royal Canadian Marine Search and Rescue and the British Columbia Search and Rescue Association gathered in the Emergency Services Garden of Honor to remember our 17 fallen comrades. Telephone Solicitation | BC Search and Rescue Association Time for your annual reminder: #CRSAR and other SAR groups in BC do not solicit donations by phone. The work doesn't stop when our subjects are found, we need to be ready for the next time we're called, day or night. No budget funding leaves local SAR team searching for answers Campbell River Volunteer Search and Rescue Society shared a link. 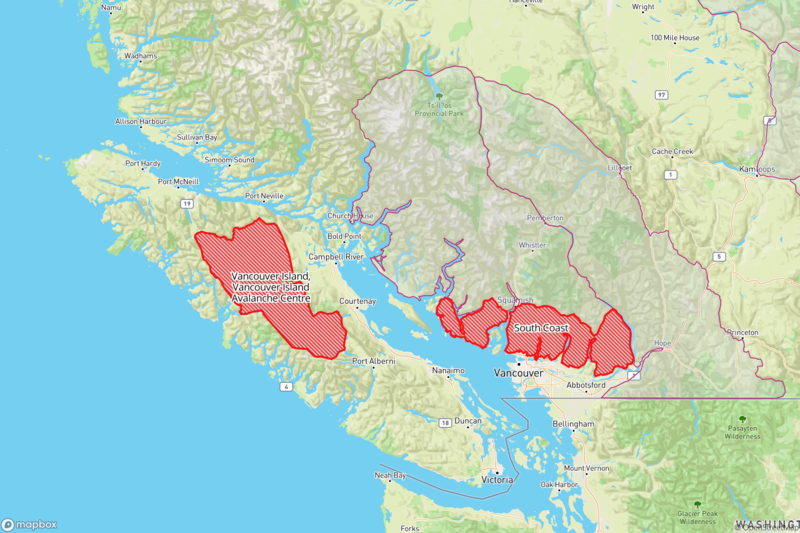 Risk of ‘deadly avalanches’ leads to warning for B.C.’s south coast - Campbell River Mirror The latest on avalanche conditions. Always consult our local source https://www.islandavalanchebulletin.com, and use best practices in regards to avalanche awareness and training when going out into the mountains. No budget funding for BC SAR groups could lead to less training and equipment Although search and rescue is comprised of 100% volunteers, equipment to keep members safe and rescue subjects is very costly. British Columbia Search and Rescue Association National AdventureSmart Coordinators & Assistants from across Canada with a total of 231 years of AdventureSmart experience! British Columbia Search and Rescue Association This is great! Know before you go and let someone know where you are going! The AdventureSmart app enables you to quickly and easily create detailed trip plans for your outdoor excursions and send them to family and friends. Photos from Campbell River Volunteer Search and Rescue Society's post Being in Search and Rescue isn't all helicopter rides and rope rescues. This weekend our members in training put in a full day learning different search techniques and stretcher skills, and put their survival skills to the test during an overnight campout! Excellent work by all! Campbell River Volunteer Search and Rescue Society is feeling proud. C’est la Semaine de l’action bénévole. AdventureSmart tient à remercier tous les bénévoles qui ont participé à la prestation du programme AdventureSmart. Sans votre dévouement envers la prévention, le programme n’existerait pas. Nous vous remercions d’accroître la sensibilisation et de réduire la fréquence, la gravité et la durée des incidents de recherche et de sauvetage au Canada. Campbell River Volunteer Search and Rescue Society shared a photo. Our President, Chris Kelly & the Executive Director for B.C. AdventureSmart, Sandra Riches responded to the Minister of Public Safety and Solicitor General, Mike Farnworth’s announcement. Join us in thanking them both for speaking on behalf of SAR response and SAR prevention in B.C. Campbell River Volunteer Search and Rescue Society shared a post. David Armitt “Scotty” MacLaren Obituary - Campbell River Mirror It is with sadness that we announce the passing of Scotty MacLaren. Scotty was a great supporter of the community of Campbell River raising money for various Campbell River organizations throughout his life including Campbell River Volunteer Search and Rescue Society. Please join the family on Saturday, March 23rd, at 11 am at St. Patrick’s Parish (34 South Alder Street, Campbell River) to put Scotty to rest and celebrate his time among us. Little did we know (even though we hoped) it would grow into an internationally sought after program making such a difference in our province. As we optimistically wait for the sustainable funding to be announced, of which it “directly supports AdventureSmart in B.C.”, we want to express our gratitude for the dedication and expertise our prevention experts continue to exude in delivering this message in B.C. Check out what they did all winter, where they did it & how! We encourage you to read their creative report and share. Thanks B.C. AdventureSmart, we’re hopeful the funding will be announced soon and you can continue making a difference. Campbell River Volunteer Search and Rescue Society shared a link. British Columbia Search and Rescue Association 31 callouts for SAR groups in BC last week, 39 people located alive. One of our teams attended a frostbite victim this past week, and it's a good reminder that even though the weather is warming up frostbite is still a very real risk. Make sure you are dressed properly and keep your skin covered. Campbell River Volunteer Search and Rescue Society is with Angela Janicki and 3 others. Campbell River Volunteer Search and Rescue Society is feeling excited. We’ve issued a Special Public Avalanche Warning for the South Coast and Vancouver Island. This video from yesterday demonstrates just how touchy the weak layer is in these regions. Make sure you’ve read the warning carefully if you’re planning a backcountry trip in these areas. Our very own “BC reps” contributing to the national SAR prevention program (including the new Trip Plan App), thanks to Tenacious D Sandra Riches Lindsay Eastwood & Alex Michaels for their contributions. Underwater Egress Training Helicopters are an effective tools for us at Campbell River Search & Rescue whether it is for a Class D Fixed Line rescue or to fly in our expansive search area which goes from Porty Hardy to the North, Bute Inlet to the East, Oyster River to the South and Nootka to the West. Today a few our members were practicing how to exit a helicopter or fixed wing aircraft if it goes down over the water with Pro Aviation Safety Training. Always be prepared and practice for the worst case scenarios. Go to the app store and download the AdventureSmart app today! Great news on the SAR prevention front - the free new #AdventureSmart app! Share far and wide! With the AdventureSmart Trip Plan app you can easily create trip plans and send them to your family and friends. The app is available free in the Apple App Store and Google Play, and can also be accessed from any web browser. Campbell River Search and Rescue, like other SAR groups in BC relies upon donations and grants in order to maintain our equipment, train our volunteers and keep the lights on.